This is a really easy seafood pasta salad recipe. 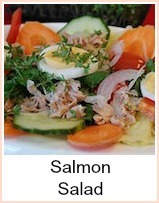 I've given instructions for canned salmon, but you could easily substitute frozen or canned prawns, shrimp, crab, tuna or anything you like really. When you've opened the salmon, drain it and take away the skin and bones. Then flake it into large chunks. Chopped cooked chicken is an option too. You need to use small pasta shapes, macaroni, shells, bows, whatever, but make sure they're fairly small. The important thing is to rinse the pasta well after it's cooked, that way you will get rid of the starch and it will stay separate instead of clumping. Boil the pasta and then drain and run under plenty of cold water to cool. Take a large bowl and mix the mayonnaise, mustard and milk together. It should be a good coating consistency - if it's too thick, then add a drop more milk. Tip in the pasta, onion and tomatoes and stir thoroughly. 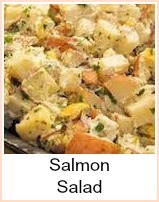 Add the salmon and mix through. Scatter the basil leaves over and serve. This would be good as part of a buffet or serve it with some fresh crusty bread and butter as a quick meal. 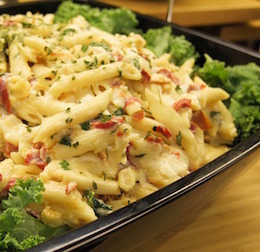 A very adaptable seafood pasta salad. 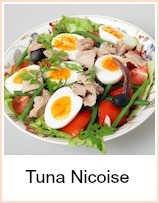 You can use canned or fresh cooked fish. Perfect for a buffet, family tea or picnic.